Steve and I are lucky enough to live opposite Wimbledon Common. This not only means regular Womble hunts but an abundance of fresh blackberries. We decided to make a sorbet with this year's pickings but thought we would give it a grown up twist with the addition of aniseed. I am sure that Madame Cholet would have approved. Place the sugar, water and aniseed in a pan. Heat slowly to dissolve the sugar and bring to the boil. Switch off the heat and leave to cool for 10 - 15 minutes. Meanwhile, press the blackberries through a sieve over a suitable bowl. Scrape underneath so that nothing is wasted. Now take a clean sieve and strain the aniseed syrup into the bowl with the blackberry juice. Stir well and pour into a plastic tub. Place a lid on the tub and freeze for 3 hours. 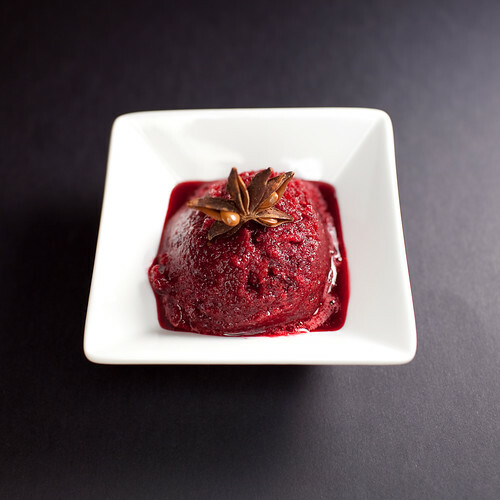 Use a fork to stir up the sorbet and then put back in the freezer for another 45 minutes before stirring again. Keep doing this every 45 minutes until the sorbet has formed a soft crumbly texture firm enough to form scoops. This will take in the region of 4 hours.